Eastern senior Blaise Facemyer (12) slips the grasp of Southern senior Reece Reuter (25), during the Eagles’ 27-26 victory on Saturday in Tuppers Plains, Ohio. Southern senior Brody Dutton (1) hauls in a touchdown pass in front of Eastern senior Dylan Creath (14), during Saturday’s TVC Hocking showdown in Tuppers Plains, Ohio. TUPPERS PLAINS, Ohio — The very thing that makes a rivalry, well, a rivalry. 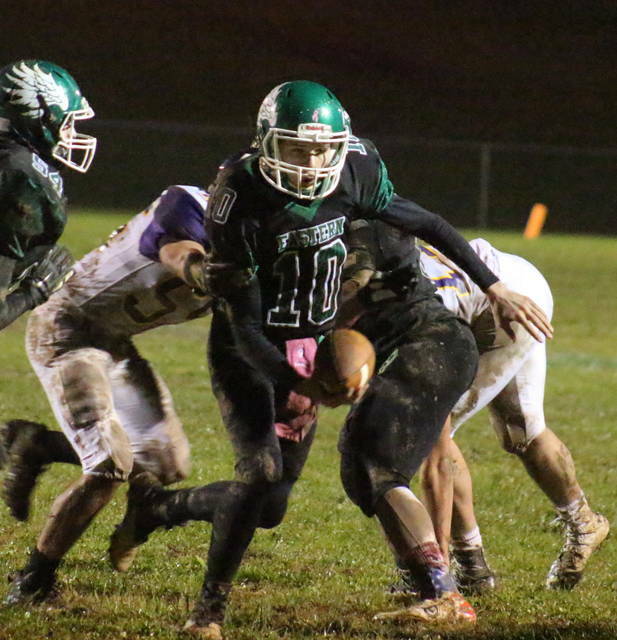 The Eastern football team defeated Tri-Valley Conference Hocking Division guest Southern by a 27-26 clip on Saturday at East Shade River Stadium, with the Eagles scoring the go-ahead point with just 21 seconds left in regulation. 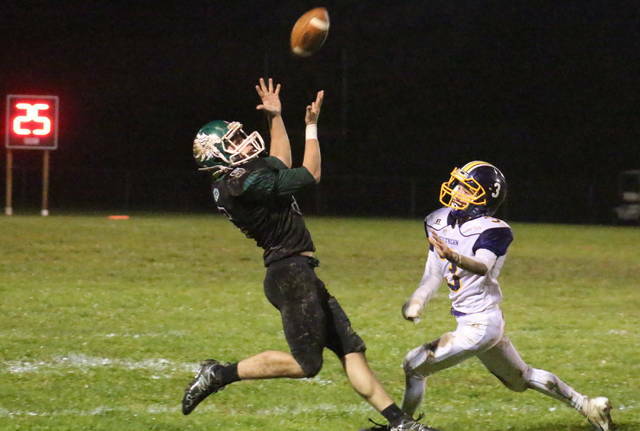 The Tornadoes (6-4, 4-4 TVC Hocking) — who entered the contest with a ‘win and you’re in’ playoff scenario — scored the game’s opening touchdown on their second offensive drive, as senior quarterback Logan Drummer connected with junior Trey McNickle for a 63-yard touchdown pass with 5:52 left in the first. Southern’s point-after kick missed, leaving its lead at 6-0. Eastern (5-5, 5-3) responded on its next drive, as the Eagles picked up five first downs before sophomore Conner Ridenour tossed a six-yard touchdown pass to classmate Blake Newland. Mollie Maxon made the extra point kick, giving EHS a 7-6 lead with 43 seconds left in the first. The Tornadoes were forced to punt on their next drive, but the snap went long and Eastern took over on a short field. EHS made its lead 14-6 with 9:02 left in the first half, as sophomore Steve Fitzgerald found paydirt on a three-yard run and Maxon added the point-after kick. Southern ended its offensive drought with 1:03 left in the half, as McNickle hauled in a 35-yard touchdown pass from Drummer. The two-point conversion pass was incomplete, however, leaving Eastern with a 14-12 halftime advantage. The Purple and Gold reclaimed the lead with 5:06 left in the third quarter, as Drummer connected with Brody Dutton for a 24-yard scoring pass. Southern’s two-point conversion run was stuffed by the Eagles, leaving the Tornado advantage at 18-14. Southern’s lead lasted 12:15, as Eastern regained the advantage with 4:51 remaining, when Fitzgerald scored from one yard out to cap off a drive that featured a pair of fourth down conversions. The Tornadoes blocked the point-after kick, to keep Eastern’s edge at 20-18. The ensuing Tornado drive lasted 4:08, with Drummer scoring from 13 yards out to give the guests a 24-20 edge with 43 seconds left. Drummer tossed the two-point conversion to McNickle, stretching the SHS lead to 26-20. Eastern ran a hook-and-ladder play to perfection on their next play from scrimmage, with Drummer making a touchdown saving tackle one-yard from the goal. Fitzgerald took it from there, plunging into the end zone with 21 seconds left to tie the game at 26. Maxon’s extra point kick was successful, giving the Eagles the 27-26 lead. Southern picked up a pair of first downs before attempting a 35-yard field goal for the win. The kick had the distance, but sailed wide-right, and Eastern claimed the one-point victory. 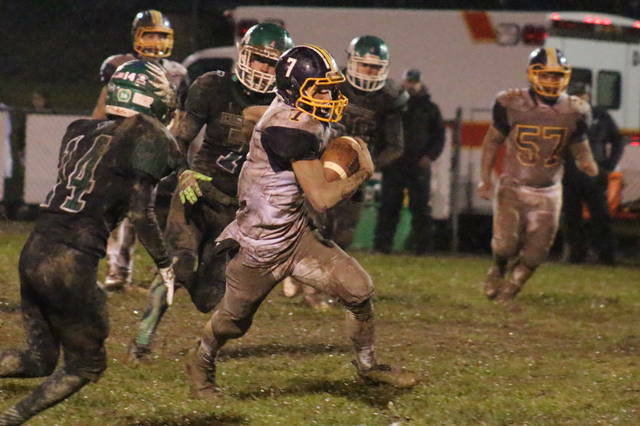 Following the win, fifth-year EHS head coach Pat Newland talked about how the Eagles pulled off the triumph after giving up what seemed like a soul-crushing score. For his seniors, Coach Newland couldn’t picture a better way to go out than ending a three-game skid against Southern with a last-minute win. Southern claimed a narrow 348-to-345 advantage in total offense, with Eastern taking a 19-to-18 edge in first downs. The Eagles outgained their guests by a 224-to-91 count on the ground, with the hosts earning a 4.5-to-2.9 advantage in yards per carry. Both teams converted on a quartet of third downs and a pair of fourth downs. EHS was penalized seven times for a total of 33 yards, while Southern was flagged six times for 45 yards. 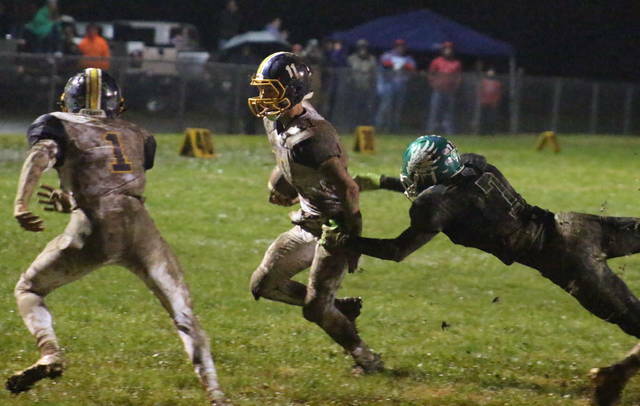 Neither team turned the ball over, despite the rainy, muddy conditions. Blake Newland led the way with 221 total yards for the victors, posting a game-high 155 yards on 31 carries, to go with a team-best four receptions for 71 yards and a touchdown. Ridenour was 7-of-16 passing for 121 yards and one score, while adding nine yards on a pair of carries. Fitzgerald posted 63 yards and three scores on 16 totes, Isaiah Fish added 37 yards on a pair of receptions, while Blaise Facemyer had 10 total yards with one catch and one carry. For the Tornadoes, Drummer was 15-of-19 passing for 257 yards and three touchdowns, while rushing 14 times for 30 yards and one score. McNickle had 170 total yards, with a team-best 72 yards on 12 carries to go with two touchdown receptions totalling 98 yards. Gage Shuler caught a game-best nine passes for 103 yards, while rushing once for five yards. Alex VanMeter carried the ball three times for six yards, Dutton caught two passes for 35 yards and a score, while Chase Bailey added two catches for 21 yards. The first one-possession game in the rivalry since Eastern defeated visiting Southern 28-26 in 2014. That was also the last Eagle win in the series before Saturday. This is Eastern’s second one-point win of the season, as the Green and White defeated South Gallia by a 14-13 clip in Week 5. SHS hadn’t been involved in a one-point game since falling to River Valley by a 13-12 count in Week 1 of the 2012 season. Southern ends the year on a three-game skid, its longest since 2015, while EHS heads into next season having won five of their final six, a feat the Eagles hadn’t accomplished since 2010. This is Eastern’s first win over a team that entered the game with a winning record since its 2014 win over Wahama, which was 4-3 after falling to the Eagles. 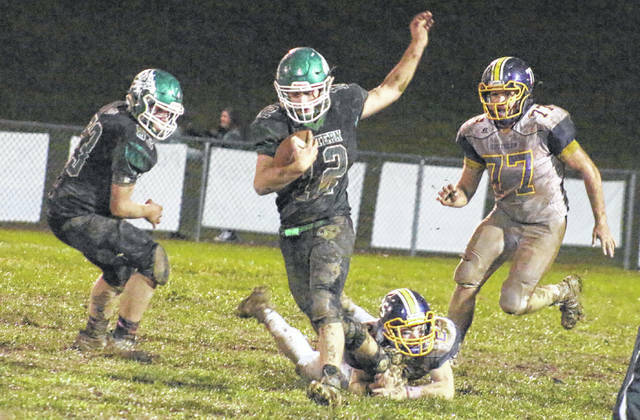 EHS hadn’t defeated a team that finished the season with a winning mark since its 2015 triumph over South Gallia, who entered the game at 2-2 and finished the year at 6-5. This is Eastern’s first time finishing a season at .500-or-better since 2014. Southern finishes the year with a winning record for the the third straight season. SHS hadn’t put a trio of winning seasons together in the lifetime of any of the players competing in Saturday’s game. Saturday marked the end of the prep football careers for EHS seniors Isaiah Fish, Nate Durst, Blaise Facemyer, Dylan Creath, Sharp Facemyer, Mollie Maxon, Dillon Aeiker, and Nick Edwards, as well as SHS seniors Brody Dutton, Weston Thorla, Logan Drummer, Austin Baker, Reece Reuter, Alex VanMeter, Ryan Mills, Auston Colburn, and Austin Arnold.